There’s more to owning Rare Coins than just their profit potential. 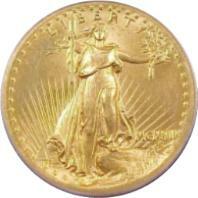 Can you imagine owning a 1907 High Relief Gold Coin like the one shown here? MOST BEAUTIFUL U.S. COIN EVER MADE! Whenever that question arises, one of the first and most frequent answers is sure to be the Saint-Gaudens double eagle, or twenty-dollar gold piece. And those who know the subject well are almost certain to specify the “Saint” with high relief. the most fascinating and beautiful creations ever struck by the U.S. Mint. United States rare date coins are highly prized today and worth far more than their weight in gold and silver alone. As important pieces of American history, they are systematically accumulated by serious rare coin collectors and prudent investors. What makes U.S. Rare Coins so appealing? There are a number of important factors to consider that will help you build your wealth while building your collection. 1. High Demand For Coins – There’s a strong and growing base of U.S. rare coin collectors who've fallen in love with coins. In the past few years, millions started collecting the new Washington Statehood Quarters. If just a tiny fraction of these coin collectors begin acquiring truly rare coins, the demand could overwhelm the limited supply and drive up prices dramatically as it has in past hot markets. 2. Collector Appeal – Coins from famous shipwrecks, silver dollars minted on the Western frontier, or gold coins struck before the Civil War enjoy a strong collector base. It’s important to remember that collectors love to own what other people can’t have. That’s why you should focus on coins that enjoy a special historic appeal to make your collection easier to sell and reap the most dividends years from now. 3. Extreme Rarity – Many gold coins we offer are so rare that they are from a limited mintage. While they can be prohibitively expensive to some collectors, many "Better Date" to relatively "scarce" coins are attractively priced between $1,000 and $3,500. We recommend you acquire the rarest and best quality coins you can comfortably afford. 4. State of Preservation – Grading is the single most important factor in pricing a rare coin. Coins are graded based on the number of scratches and amount of wear. The Sheldon scale ranks coins from a nearly worn out 1 to a perfect 70. Most investment rare coins we offer grade in Extremely Fine Condition (XF-40) to Mint State-66. 5. Eye Appeal – You should also buy coins that have beautiful designs, where the strike is sharp, and those preserved with brilliant, original mint luster. We carefully handpicks each coin we offer for great eye appeal and avoids coins with toning or problem spots. 6. Certification of Grade – Instead of depending on a buyer's or seller's opinion of a coin’s grade, you can own investment grade coins certified authentic and graded by a trusted, independent grading service. PCGS and NGC provide the most respected grading services in the rare coin industry. Most investment grade coins we offer are graded by one of these leading authorities.